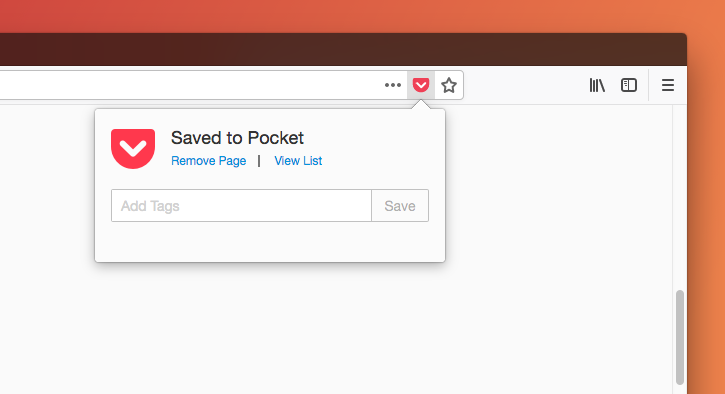 Pocket is built-in to Firefox, making it easier than ever to save pages and access your List. You can find the Pocket button in the Firefox Address Bar. If you're having trouble finding this button, continue reading for some tips to bring it back. Please check to make sure that you are using the current version of Firefox. If you're on the latest version, Pocket will automatically appear on the right side of your Address Bar when you're viewing a web site. Click here to learn how to update to the most recent version of Firefox. Previous versions of Firefox (versions 56 and earlier) included Pocket in the toolbar. Starting with Firefox Quantum, Pocket is located in the Address Bar instead. Please see the image above if you're not sure where to look. If you still don’t see the Pocket button, it might have been removed from your Address Bar by mistake. Did you install software that disables Pocket? We're aware of some software that's available which changes Firefox’s functionality, and this could inadvertently disable Pocket. If you’ve used software to change or tweak Firefox, such as CCleaner which can be used to disable Firefox Hello, this will likely have removed Pocket as well. We recommend reverting this change to re-enable Pocket. Is Pocket disabled in about:config? Is the “value” column set to "false"? If so, simply double click on this row to set it to “true”. The Pocket button will now appear in your Address Bar. Are you using an incompatible theme? It’s possible that some custom Firefox themes can cause the Pocket button to not appear. Please try disabling any custom themes in Firefox to see if this helps bring Pocket to your toolbar. Click here to learn more about managing themes in Firefox. Are you using the old Pocket Extension for Firefox? If you have the old Pocket extension installed, the Pocket integration in Firefox will be disabled by default. We recommend transitioning from the old extension so you can get the most up-to-date, reliable, and consistent Pocket experience. Click here to learn more about what’s changed with this new integration, and for instructions for how to switch.